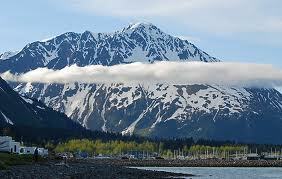 The Seward Highway is a National Scenic Highway, and for good reason! Almost immediately after your tour guide picks you up, you’ll learn why. Together we’ll drive you from your hotel, down the Turnagain Arm to the aerial tram up Mt. Alyeska. At the top we will enjoy stunning panoramas (weather permitting) in the Alaska’s stunning season of summer green. From this height on a clear day we can see glaciers and the foothills of the Chugach Mountains where they meet the sea at Cook Inlet. The next highlight is the Alaska Wildlife Conservation Center. This rescue center is home to bears, a musk ox herd, a wood bison herd that was once thought to be extinct, moose, elk, caribou, and more! Lunch is included at a local eatery and features bottomless soup of the day, sourdough bread made daily, dessert and a beverage.